Please, don't hesitate to contact us for any inquiry or question. AG11 - Cassiterite with Fluorapatite and Quartz. Panasqueira mines, Aldeia de Sao Francisco de Assis, Covilha, Portugal. 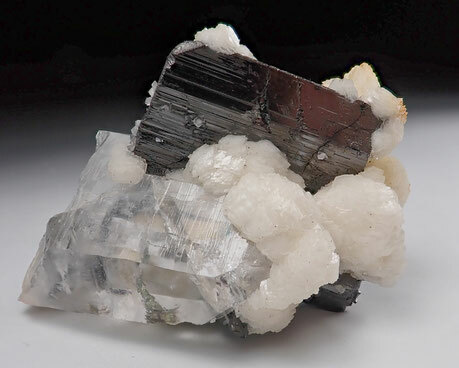 Group of lustrous crystals of Cassiterite on matrix. 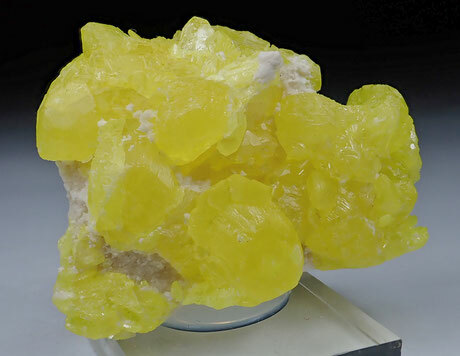 Associated to small yellow Fluorapatite crystals on the backside and Quartzs as well. It is not common to find Panasqueira Cassiterite specimens with this quality and aesthetic. Twinned crystals with highly lustrous faces. Specimen in great condition. A fine Panasqueira Cassiterite. Watch video. 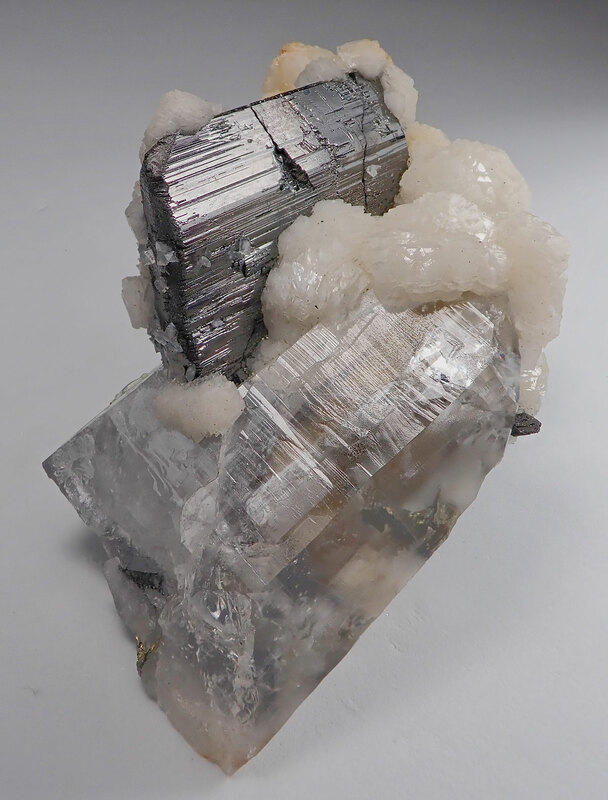 AG12 - Siderite with Quartz. Panasqueira mines, Aldeia de Sao Francisco de Assis, Covilha, Castelo Branco, Portugal. 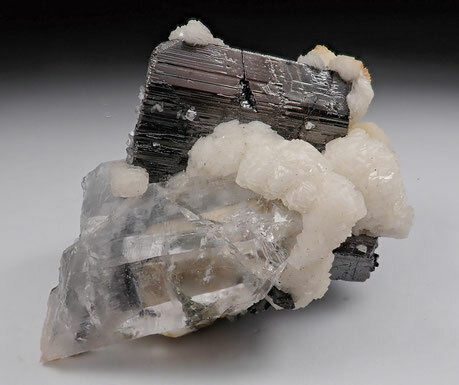 Group of rhombohedral crystals of Siderite with very well defined faces and edges. Partially coated by a thin layer of white Calcite. 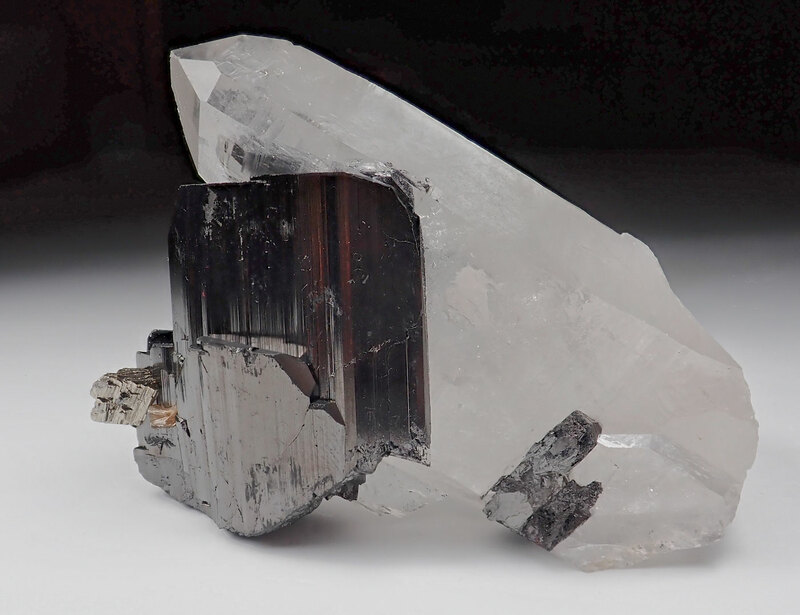 Associated to a very well crystallized translucent Quartz. In great condition. Watch video. AG13 - Cassiterite. Panasqueira mines, Aldeia de Sao Francisco de Assis, Covilha, Castelo Branco, Portugal. 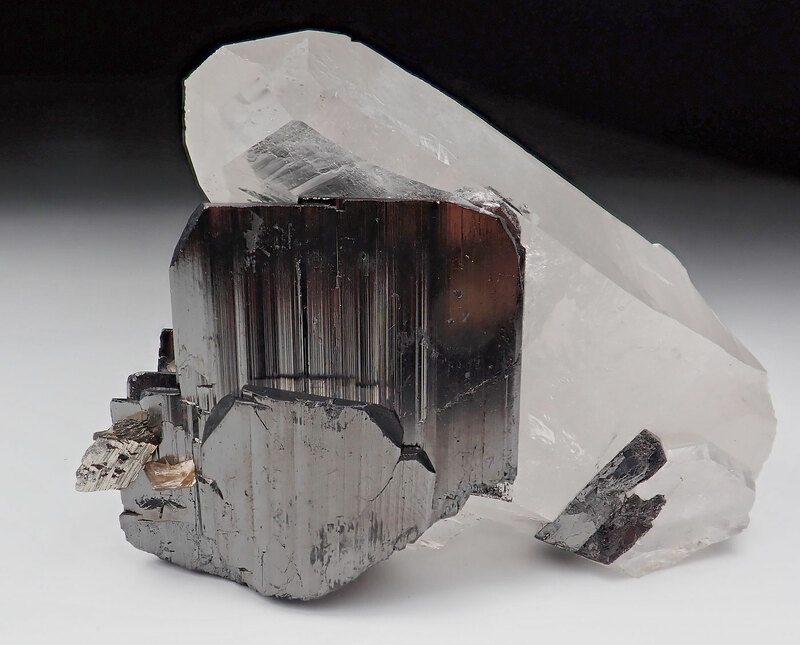 Very well formed twinned crystals of Cassiterite with high brilliance disposed on a matrix composed of Muscovite, Quartz and Arsenopyrite. Some crystal show nice brown hues. No damage. Watch video. 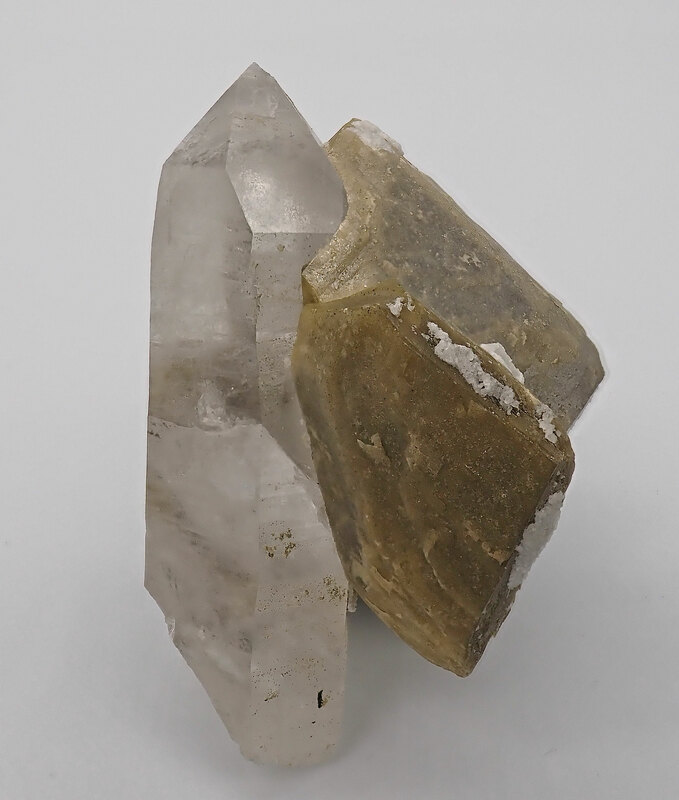 AF03 - Fluorapatite and Quartz. Panasqueira mines, Aldeia de Sao Francisco de Assis, Covilha, Portugal. Purple Fluorapatite crystals aesthetically disposed on a matrix of Quartz crystals. Some small Siderite crystals are also present. One of the most sought-after minerals by collectors are the lilac and purple Fluorapatites from the Panasqueira mines. This one is an excellent example, a very fine Panasqueira lilac Apatite suitable for demanding colectors. In excellent condition, not noticiable damage to report. Watch video. AG19 - Fluorapatite with Cassiterite. Panasqueira mines, Aldeia de Sao Francisco de Assis, Covilha, Portugal. 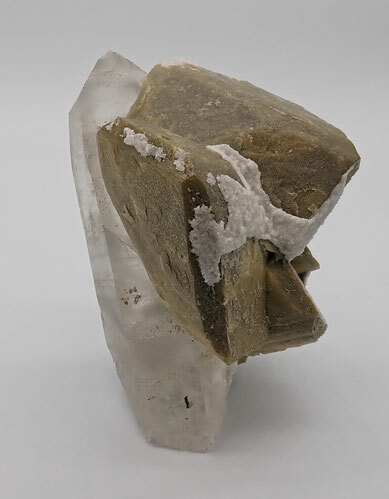 Unusual combination specimen formed of green Fluorapatites and Cassiterite crystals. In very good condition. The Fluorapatites show very good transparency and nice green color. 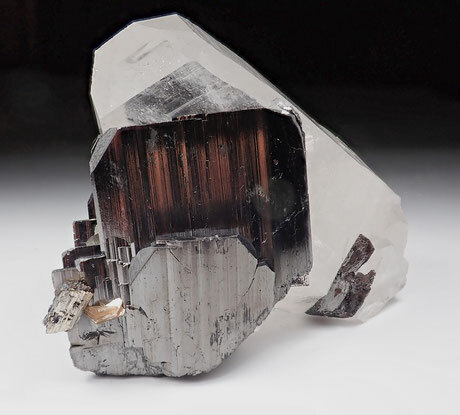 The Cassiterite crystals have lustrous faces. Watch video. AF08 - Ferberite with Siderite. Panasqueira mines, Aldeia de Sao Francisco de Assis, Covilha, Portugal. Flattened crystals of Ferberite in parallel growth coated by nice Siderite crystals on the back. Floater specimen in very good condition. Very well defined crystals, with high luster and perfect terminal faces. A classic from the Panasqueira mines. Watch video. AF09 - Quartz with Ferberite. Panasqueira mines, Aldeia de Sao Francisco de Assis, Covilha, Portugal. 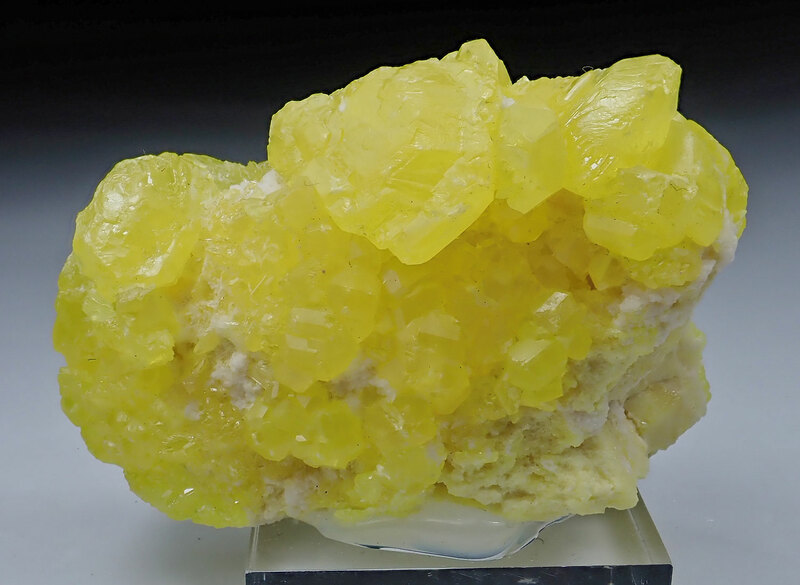 Very nice mineral specimen from the Panasqueira mines. Flattened crystals of Ferberite in parallel growth associated with a very well formed crystal of Quartz. 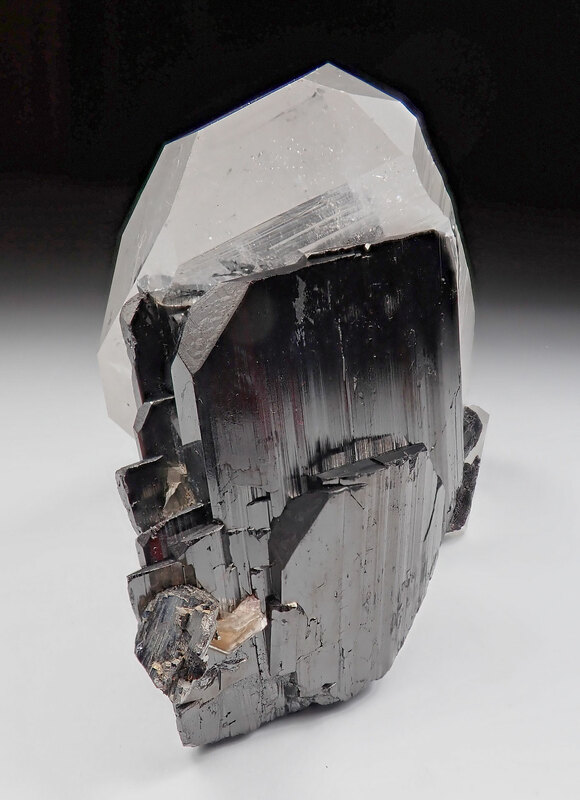 The Ferberite shows lustrous faces and very well defined terminations. A classic from the Panasqueira mines. In very good condition. Watch video. AF20 - Ferberite, Quartz and Calcite. Panasqueira mines, Aldeia de Sao Francisco de Assis, Covilha, Portugal. Aerial biterminated crystal of Ferberite perched on a matrix composed of Quartz crystals and very nice white crystals of Calcite. The Ferberite crystal shows striated faces and it is 3 cm by 2 m in size. Overall in very good condition, the bottom of the piece where was extracted from the mother rock has some damage. Aesthetic and fine Ferberite specimen. A Panasqueira classic with a very good aesthetic. Watch video. 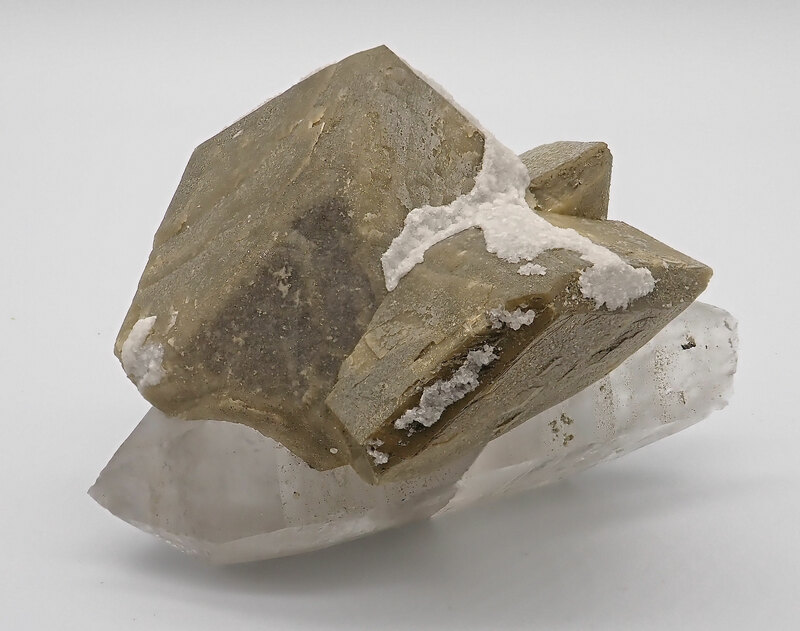 AG14 - Fluorapatite. Panasqueira mines, Aldeia de Sao Francisco de Assis, Covilha, Portugal. 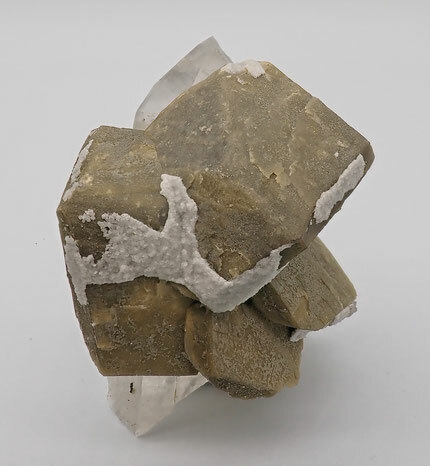 Group of small prismatic crystals of white Fluorapatite. With a niceaggregate of Pyrite at the center. Very nice specimen in great condition. Watch video. Specimen size: 6 cm x 4 cm. AG15- Siderite. Panasqueira mines, Aldeia de Sao Francisco de Assis, Covilha, Portugal. 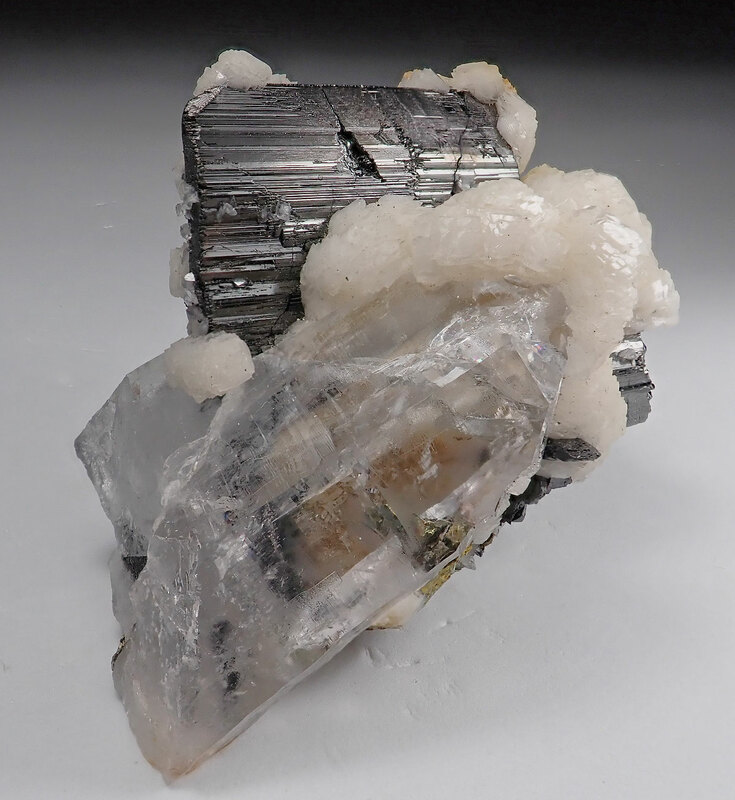 Group of flattened rhombohedral crystals of Siderite partially coated by small lustrous crystals of Pyrite. specimen in very good condition. Watch video. AF10- Sphalerite with Dolomite. Las Mánforas mine (Aliva mine), Camaleño, Cantabria, Spain. 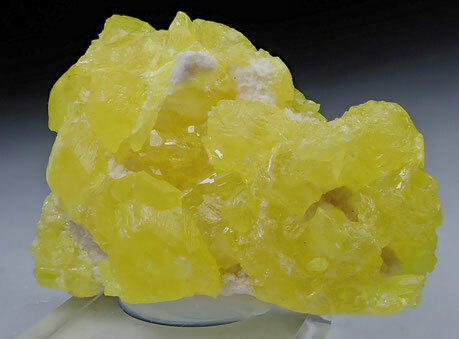 Fine Spanish mineral specimen. Aerial aggregate of nice crystals of Sphalerite showing curved faces on a matrix of Dolomite. Complex crystals with good luster and a nice toasted honey color. Great contrast to the matrix of white Dolomite. A classic mineral from Spain. In excellent condition. Watch video. AF11- Sphalerite with Dolomite. Las Mánforas mine (Aliva mine), Camaleño, Cantabria, Spain. Excellent Sphalerite from Las Mánforas mine. Translucent to transparent crystal with curved and flattened faces, with a vivid and uniform honey color. The faces are partially coated by white crystals of Dolomite. Nice specimen in excellent condition. Watch video. Specimen size: 6 cm x 3 cm. AF12- Sphalerite with Dolomite. Las Mánforas mine (Aliva mine), Camaleño, Cantabria, Spain. Spanish Sphalerite from Las Mánforas mine. Translucent to transparent crystals with curved and flattened faces, with a vivid and uniform honey color. Nice specimen in excellent condition. Watch video. Specimen size: 4 cm x 2.5 cm. AG16- Brookite. Kharan, Balochistan, Pakistan. Brookite crystals on a matrix with crystallized Quartz. The Brookite crystals show sharp terminations, very well defined faces and edges, good transparency and a nice red-brown color with phantoms. In excellent condition. Watch video. Specimen size: 3 cm x 1.5 cm. Biterminated prismatic crystal of Elbaite completely transparent with nice color. No damage. A very nice Tourmaline specimen from Paprok. Watch video. 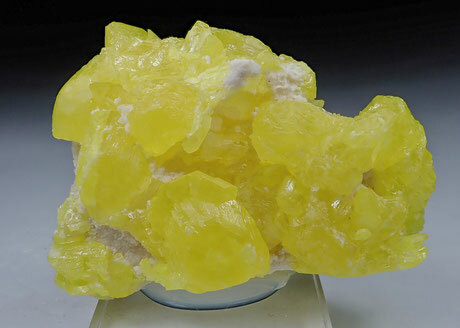 AD30- Sulphur with Aragonite. Cozzo Disi mine, Casteltermini, Agrigento Province, Sicily, Italy. Classic mineral specimen from one of the most famous localities in Italy, closed more than 30 yeras ago. It consists of a cluster of lustrous Sulphur crystals accompanied by Aragonite composing an aesthetic mineral specimen. Intense yellow color. In excellent condition. Watch video. AG18- Sulphur with Aragonite. Cozzo Disi mine, Casteltermini, Agrigento Province, Sicily, Italy.